ANNOUNCEMENT: Registration has now closed for the course that began 8th April. Please contact Prof Caroline Watt if you’ve got any questions or would like to be notified when registration opens for the next course, six weeks before the 9th September 2019 course start date. You will be a visiting student at the University of Edinburgh, one of the world’s top universities. The course provides a balanced and comprehensive overview of parapsychology, along with privileged access to journal articles and materials that have been exclusively developed for the course. The course leader, Professor Caroline Watt, is an international expert in parapsychological research and education, and has over 30 years of experience in this field. Do I need any qualifications in order to join the course? No previous knowledge is required, just interest and enthusiasm. Some specialist reading has a more advanced level of difficulty, suitable for those with an undergraduate degree, but accessible summaries of this material are always available. You will just need to have access to a computer and the internet, be able to download and open pdf and mp3 files, and to post messages on a discussion board. For the best learning experience, use the latest versions of Chrome, Firefox, or Safari browsers. The course does not run effectively on Internet Explorer. It works on both Macs and PCs, and an app is available for portable devices. All materials are in English. Will I have to visit the University of Edinburgh in person at any point? No, the course is taught entirely online. Do I get a certificate of completion from the University of Edinburgh? Yes. Provided that you have shown a reasonable level of engagement with the course materials and activities, you will receive a University of Edinburgh crested certificate of completion. To obtain the certificate you must participate in the various activities that are provided in each week of the course: online quizzes, discussion boards, podcasts, and readings. Do I have to take a formal exam at the end? No. This is a non-accredited course which is intended for personal development only. The course is not examined and completion of the course does not provide any formally recognised qualification or course credits. How many students are on each course? There is a maximum of 40 students per course. Students are split into study groups of around 20 individuals. You are expected to undertake the core and specialist readings, listen to the audio interviews, try the self-test quizzes, and perhaps most importantly, discuss topics with fellow students. The course leader doesn’t engage in personal tutoring, but does regularly view the discussions and post comments to stimulate further reflection. Can I work on the course at my own pace? All course materials are available from the first week, so students can read/listen ahead if they like. However, the discussion boards are only opened at pre-determined dates to ensure that all students discuss particular topics at the same time. The course will close after week 10, so all students must have accessed the course materials by then. How many times does the course run per year and when are the starting dates? The course runs twice per year, starting in April and September. In 2019 it will run from 8th April and 9th September. You should allow sufficient time to obtain the course textbook (see below) before the start of the course. How do I register for this course? Please click the link at the ANNOUNCEMENT on the top of this page, and follow the instructions thereafter. The standard registration fee is £300. What course materials do I need to obtain in advance? 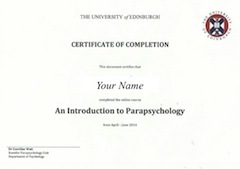 You will need to obtain a copy of the course textbook, An Introduction to Parapsychology. All other materials and activities are provided free of charge during the course, including: pdf files and mp3 audio files. Please note that these materials are copyrighted and are provided for your personal study use only. You are granted privileged access to them through your status as a visiting student of the University of Edinburgh, but are not permitted to copy or otherwise distribute them to others. Is there any discounted fee rate?